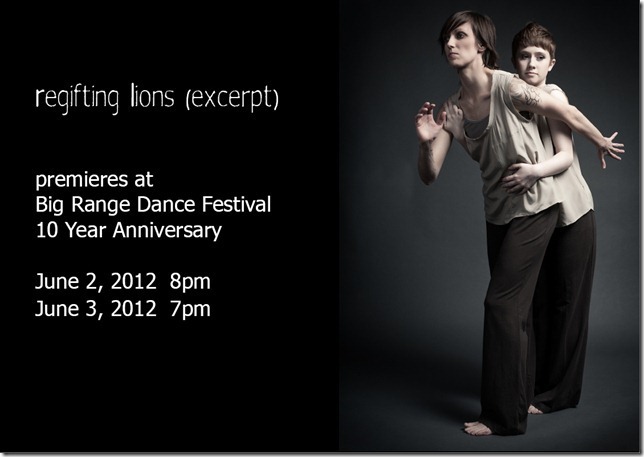 A section of ReGifting Lions will be performed at Barnevelder on Saturday June 2nd at 8pm and Sunday the 3rd at 7pm. The performances are part of the 10th annual Big Range Festival. Admittedly, I haven’t been very present at rehearsals, and have mainly seen only rehearsal videos of the piece, so I’m excited as Hell to see this thing live. I’m rather proud of the music. Scored for two electric guitars, marimba, and piano, it thoroughly seals the deal that I have spent a better part of the past decade as a closet minimalist. Process built around additive procedure? Check. The piece that will be used for this performance is a reworked version of the final moments of a much larger piece I originally wrote for ReGifting Lions. As I tend to do, I threw myself head first into this project, worked fastidiously for two months, and surprised the whole crew by just how far I can get ahead of myself. As things turned out, presenting half of the show’s worth of music to the choreographers months before having the show even figured out wasn’t the smoothest of ideas. A lot of the music is more than salvageable, so I’m happy. Let’s face it, I’ve done dopier things. Note to other eager, young composers: COMMUNICATE. Follow the hotlink to the ReGifting Lions website. In other awesome news, it looks like I will be composing and performing some music for a puppet theater piece based on the short stories of H.P. Lovecraft. The performances won’t be until early 2013. I’ll update more about this as it all unfolds. Here’s another hotlink, this time for The Ornery Theatre.